Stan Lee’s Lucky Man returns for a second Sky 1 series on Friday, with James Nesbitt as Detective Inspector Clayton. Nesbitt as Detective Inspector Harry Clayton is still refusing to use his new-found power to help him. Together with DS Suri Chohan, played by Amara Karan, they go about solving murder cases. In this series, a chance meeting with the enigmatic Isabella (Thekla Reuten) challenges what he knows about the lucky bracelet. Filmed from June through to November last year, the series was shot in Southwark, Lambeth, Lewisham, Haringey, Islington and Camden. It’s a home on Bermondsey Street in Southwark that features as Harry’s flat. A donation was made to the Bermondsey Residents Association to thank them. In a show with a lot of falling off buildings, one such heart stopping scene was shot at 53 Southwark Street. The Mondrian Hotel on Southwark’s Upper Ground plays a casino and a penthouse. When Harry and his wife Anna head to a nice hotel to discuss their marriage, it’s the Mondrian Hotel, although the hotel check-in sequence was filmed inside the Blue Fin building. The Blue Fin Building is also used as a hospital. 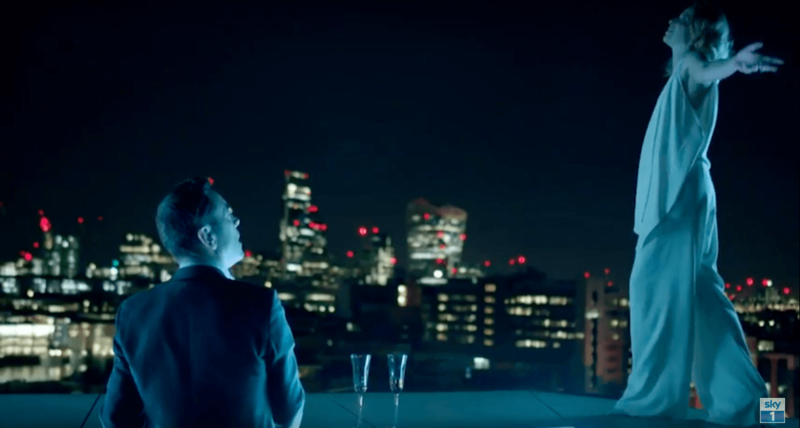 And the rooftop bar was filmed as well. You see some more falling off buildings from here in the trailer. Harry is driving along Holland Street, when a warning light comes on, so he pulls over. As the engine cuts out, he sees Isabella. On Rotherhithe Street, a van drives over the iron bridge. The action for a family boat trip on the River Thames was filmed from Bankside in Southwark. In neighbouring Lambeth, at Festival Pier, the boat trip heads off. Still in Lambeth, on the Albert Embankment, a character dies – attracting police cars and an ambulance. Fire, a nightclub in a Parry Street railway arch was used for filming. And on Miles Street we see a character staggering through to dark tunnel after a stabbing. In Lewisham’s Cold Blow Lane, CCTV footage shows Eve putting pipe into a commercial bin. It was Eve who attached the lucky bracelet to Harry in the first series. We also see her racing through a tunnel on a motorbike. And still on Cold Blow Lane, Isabella is watching Harry. In Islington’s Crinan Street, a door is broken down to a family eating breakfast – who have never heard of Isabella. Charterhouse Street and St John’s Square are used as well. In Haringey, Old Hornsey Town Hall is used for a series of interiors. And a character’s house is set in Hurst Avenue. Here, she is questioned by the police, who are looking for Harry. Police cars and offices arrive to search the area. In Camden, the series filmed inside a home on Rochester Road. In Bloomsbury Square Gardens, Harry and Anna sit on a park bench chatting. Senate House on Malet Street was used, and on John Street, Harry gets out of his car and walks along the street to a clinic. In Camden Mews, Harry walks along a cobbled road to meet other police officers, before they force their way in to a home to search for clues. FilmFixer manages the film office service for Southwark, Lambeth, Lewisham, Haringey and Islington councils. Andrew Pavord adds, “Once again we are extremely grateful to the Met police’s film unit for providing permitting and support across many of Lucky Man’s scenes. “It’s a feature of the software we use that the Met are automatically alerted during the permission process where necessary – making it quick and simple for everyone all around, rather than an extra burden. “These included the scenes involving falling off a roof in Southwark, which was actually quite simple to film but needed to be managed carefully from street level, particularly given that we had actors in police uniform involved. “In Islington’s Wilson Street, we had the road closure and SWAT team scene to film. Again, that had to be handled very carefully to minimise any disruption it might cause to real traffic and to ensure nobody became concerned at the sight of a fake SWAT team – all this had to be shielded from the public. Andrew Pavord also thanked the production for its considerate behaviour with London locals and generous donations paid to residents groups including not just the Bankside Residents Forum in Southwark but also the Shad Thames Residents Association. In Camden donations were made to Friends of Bloomsbury Square, the Red Lion Square TRA and Friends of Red Lion Square as well as the Camden Square Neighbourhood Association.